TUBERCULOSIS: IS THE BCG VACCINE ANY GOOD? General Medical Practitioner, practising in South London. Tuberculosis is a disease caused by infection of a susceptible person with the tubercle bacillus. This bacillus is from the family, Mycobacteria. Mycobacteria are very common and live all around us in tapwater, grass, mud, hay, rubber tubing and. so on. Most do not cause infection in humans. Those that do need certain conditions: overcrowding, poor ventilation, dusty atmosphere, poor and low protein diet, migration, grief. People anywhere that are uprooted, torn away from families, packed into shoddy accommodation with low pay and bad working conditions will be susceptible to tuberculosis. Tuberculosis was described among city builders in Greek and Roman times and devastated Europe during the eighteenth and nineteenth centuries with the advent of the Industrial Revolution, mass production, slum cities and subsistence wages. In the 1800s seven out of every ten people became infected with the tubercle bacillus in the course of their lifetime but only one in seven died from the disease. The people who died were immigrants, industrial workers and the homeless (1). Rich, well-nourished people became infected too but were less likely to die, except that by virtue of their wealth they could afford the ministrations of the physicians of the day. Treatments such as purging and repeated blood letting often sapped their vital strength and saw them off despite their advantages. Many famous artists, musicians and poets succumbed to tuberculosis, contributing to or instigating the pathos of this romantic period. Overwork, poor diet and damp, airless accommodation assisted the process (2). Mycobacterium tuberculosis is spread from person to person by coughing, sneezing and talking. It does not take many bacilli to infect a susceptible person but it may take months living in the same house before this happens. When the disease is spreading across parts of the lungs and forming cavities, people may produce large amounts of bacilli and are more infectious. Tuberculosis is not spread by clothes or bedding. Tuberculosis began to disappear from England in the 1850s. The shambolic growth of cities was taken in hand. Public health acts provided a basis for improved sanitation, new building standards and slum clearance (3). Streets were widened, sewers were walled in, the dead were buried outside of towns. Railways were built bringing fruit and vegetables to urban centres. Ventilation of jails and hospitals was improved. The increased use of glass in windows sounded another death knell for tuberculosis. Mycobacteria are highly susceptible to ultra violet radiation and transmission rarely occurs out-of-doors in daylight (1)(4). Mortality from tuberculosis fell as immigrants from the countryside became accustomed to their new situation. Factory acts improved the lots of workers and children. It still remained high among newer immigrants such as the Irish and those from the Indian subcontinent today, by the very fact of their migration. The tubercule bacillus was discovered in 1882 by Robert Koch, a German scientist. This virtually single handedly put an end to measures aimed at the improvement of public welfare as a way of reducing disease. Doctors went rushing in the direction of drugs, antisera and vaccines. It is a shame that we all remember Louis Pasteur as the inventor of the germ theory of disease but his deathbed recantation: "The soil is everything; the germ is nothing" is less widely publicised. Deaths from tuberculosis in this country fell from 270 to less than one per 100,000 population between the 1850s and the 1980s, apart from a couple of blips during world wars I and II, for obvious reasons. 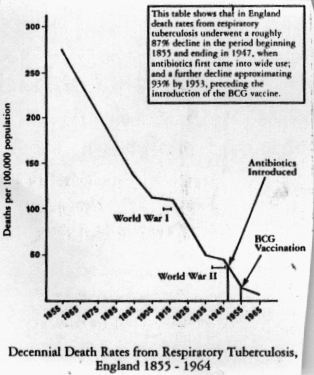 The introduction of anti-tuberculous drugs in the 1940s made no difference to the rate of fall and neither did the introduction of the BCG vaccination in the 1950s (5). Countries like the U.S.A. who have never used BCG in their vaccination program show the same rate of decline in death rates from tuberculosis. At the end of the twentieth century there were 17 million cases of active tuberculosis in the world, 60% in Asia (6). It is a growing problem, with eight million pulmonary (lung) cases a year and three million deaths. As many as one third of the worlds population is infected with M. tuberculosis (7). Annual deaths from tuberculosis are still ten times greater than all the deaths from HIV put together (8). Tuberculosis is decimating the Philippine slums. It is now that countrys fourth biggest cause of death, killing 20,000 people a year and disabling hundreds of thousands more (9). Why is this? In the United Kingdom the incidence of disease in inner cities began to rise in the 1980s. During the same period New York experienced an epidemic (10). In 1995 numbers started to rise in Amsterdam (11). Why? - For the same reasons that tuberculosis has always flourished - poverty, overcrowding, poor housing, poor diet, unemployment, misery and migration. Having HIV doesnt. help either (12 - 15). You may be wondering at this point what good a vaccine against tuberculosis would do, when the cause of human tubercular disease is so obviously seated in a persons environmental and social context. It is a good question. Exposure to other common mycobacteria has been observed to confer a degree of protection against becoming infected with the tuberculosis bacillus. This was seen when children who drank unpasteurised milk developed mild forms of bovine tuberculosis but did not contract the human type. However, some people do worse, for example, those with the mycobacterial disease of leprosy (1). The BCG vaccine (Bacillus Calmette Guerin) is an attenuated (less lethal) form of the bacillus. Inoculation with BCG is supposed to substitute the natural and potentially harmful primary infection with tubercle bacillus for an artificial and innocuous (harmless) primary infection with attenuated bacilli that have maintained the immunogenic (ability to cause an immune response) properties but not the pathogenicity (ability to cause disease) of the tubercule bacillus (16). There are problems. Over the years the original live vaccine has evolved into an array of different strains with unknown properties and immungenicity (17). Very little is known about the correlation between dose of BCG and protection against tuberculosis in humans. A lot more is known about the dose of BCG required to give a certain size of response to tuberculin testing but this is not the same thing. BCG certainly induces tuberculin sensitivity. Sensitivity to a tuberculin skin test (Mantoux or Heaf test) is the commonest and cheapest way of diagnosing and contract tracing cases of tuberculosis. This is how tuberculosis has been managed in the United States. After being vaccinated with BCG it is less clear whether the sensitivity reaction is due to vaccination or the disease. In this country it causes a lot of confusion as to who should be investigated further (18)(19). The vaccine also interferes with the resistance created by exposure to local, non-pathogenic (friendly) mycobacteria. BCG vaccination may even be altering the bodys response to the tuberculosis bacillus in such a way that it is contributing to the resistance of tuberculosis to all of the drugs currently used to treat it. This is a global problem of massive proportions (1). The history of immunisation against tuberculosis is a story of setback, controversy and surprise (20) said a leader in the Lancet in 1980. Trials of BCG vaccination have shown protection against tuberculosis to vary between zero and 78%. The best result was from a trial in UK school children from the 1950s. In the 1960s, the Indian Research Council and the World Health Organisation carried out a very large, well designed, double-blind controlled trial of 360,000 people in Madras, South India. The results showed that more of those vaccinated with BCG got tuberculosis than those who had not been vaccinated (16). These discrepancies are not just due to the differences between the developed and the developing world. A recent study of children returning to the UK from the tropics showed that 75% of those vaccinated against Tb did not respond to tuberculin testing (a protective effect of 25% maybe?) (21). All of 62 cases of French hospital employees who had contracted tuberculosis at work had been vaccinated with BCG (22). Trials in the United States varied in protection from zero to 75% (16). Many reasons have been put forward for the differences in the performance of the BCG in different trials and most of them, equally, have been refuted. What is clear is that where it is really needed it doesnt seem to work. Even at best its efficacy appears to be much less than that claimed for other widely used vaccines. It is when reading about research into new vaccines against tuberculosis that the full ineffectiveness of the BCG becomes most apparent. One also becomes increasingly aware of how little scientists and doctors know about tuberculosis at all. "Immunity to tuberculosis vaccine presents a daunting task in the face of our limited understanding of the organisms virulence (ability to cause disease) and the hosts (humans) immune response. "(23) "Understanding how the bacterium invades cells may be an important first step towards developing a vaccine to prevent tuberculosis. "(24) -- I thought we already had one This is certainly not what it says on the information sheets that children take home so that their parents will sign the consent form for the schools vaccination program. It is also not the information given when vaccinating newly arriving immigrants to this country nor to new parents in areas where all babies are vaccinated. So where does this leave us with regard to BCG vaccination and protection against tuberculosis Maybe we should take a tip out of Pasteurs book and concentrate on nurturing our "soil". What is the "soil"? The soil is our body and our immune system. A healthy diet with lots of clean water, fresh air and exercise will make us strong so that we will not be susceptible to tuberculosis (the seed) nor to any of the other micro-organisms by which we are surrounded. Tuberculosis is not the only disease whose death rate has plummeted since the nineteenth century. Scarlet fever, rheumatic fever, measles, diphtheria and whooping cough are some of the others and their death rates fell for the same reasons. While we concentrate on food and nutrition let us also not forget the other ancient adage: "mens sana in corpore sano - a healthy mind in a healthy body." We do well not to forget the important part that emotions play in our health. Allowing ourselves the time and the space to balance our emotions and nurture our relationships with others is more important than the right vitamin supplement or exercise program.